Montgomery County Office Space Conversion Blog Post – In a previous blog post, we explored trends likely to impact the adaptive reuse of office buildings, as illustrated through the Octave 1320 office-to-residential conversion in downtown Silver Spring. With its final unit now sold, the successful project prompted us to think about the future of office conversions in Montgomery County. Office Market Assessment Report – The Montgomery County Planning Department has completed an in-depth assessment of regional office market conditions and the implications for Montgomery County. Prepared by Washington, DC-based Partners for Economic Solutions (PES) and Research and Special Projects Division staff, the 106-page study examines an array of economic forces changing the Washington, DC region’s office market and best practices for next-generation office development. Staff presented this study to the Planning Board at its public meeting on June 25, 2015 and to the Montgomery County Council’s Planning, Housing & Economic Development (PHED) Committee on July 13, 2015. Learn more about the Office Market Assessment Report. View the infographic and presentation. Aspen Hill Minor Master Plan Amendment Market Analysis – The Aspen Hill market analysis consists of three reports: Office Market Analysis, Retail Market Analysis, and the Residential Market Analysis. These reports assess the feasibility of future office, retail, and residential uses within the Aspen Hill Minor Master Plan Amendment area. Sandy Spring Rural Village Market Analysis – The Sandy Spring retail market report analyzes the existing commercial retail environment as well as future types of retail businesses supporting the village center concept of the Sandy Spring Rural Village Plan. The report recommends suitable retail niches for the village center and characterizes the building spaces needed to accommodate these types of businesses. 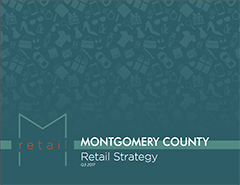 Review the Industrial Land Use Trends Study for Montgomery County (presentation and white paper).